Everything is moving to the cloud. Your family’s grocery list, your company’s email platform, Microsoft Office, your building’s data and predictive analytics. So why aren’t your commissioning libraries and tools as well? 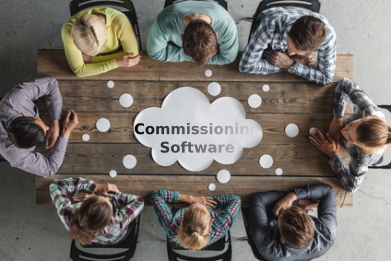 In this article we discuss some common pros, cons, and challenges from the industry around cloud based commissioning software. The benefits of having real time and continuous access to data from anywhere and from any device are well understood. This is the way of the world we live in and the expectations most of us have when it comes to interactions with our data and technology. Unfortunately, in the construction and building industries, we are playing catch up (although we’ve been making good progress in getting back on track lately) with regard to taking advantage of this efficiency in the same way other industries have. Historically, commissioning has been managed through a combination of a firm’s library of template forms, checklists, other documents, emails, issue logs, and meetings. Each firm has their own customized processes and methods they’ve developed over years of practice, but most commissioning projects involve some degree of documentation collection, quality control/quality assurance processes, and documented testing activities. Because of the intense level of detail, documentation, communication, follow-up tracking, and reporting required, the commissioning process benefits greatly from the automation and collaboration a cloud based platform designed specifically for building commissioning can deliver. It is a great benefit to all project stakeholders, from contractors to project sponsors, to have instant access to real time information. Naturally, once all of the information can be shared this way, the need for status meetings goes down. And the meetings that are held can be more productive. Relying on emailed copies of issues logs, checklists, and other records results in a constant need to maintain master copies and keep multiple party’s documents in sync. This is significant waste of time compared to the benefit of an entire project team working from a cloud-based commissioning platform, where all changes are instantly available to everyone. Furthermore, the transparency and visibility of the process is also enhanced. Important project stakeholders and sponsors can be given access to view dashboards, charts, and other summarized data about their project. Gathering and organizing documentation from checklists, tests, meetings, issues, images, etc. from the entire project is a formidable challenge. Transferring this information to a coherent, organized, and professional report is an even greater one. A good cloud based commissioning software will automate a significant portion of a final report. This takes burden off of the project team who can then focus on the work they need to do on a given project, and allow them to continue to the next one more seamlessly and quickly. I wrote about selecting new software for your business in this article. After settling on a given product, there will be an initial investment of time to get your team comfortable with it and to integrate it into your day to day workflows. It’s easy to get discouraged during this phase, and the value a software tool can offer will turn negative if it’s not used properly or fully understood. Online Cx tools are the future of the commissioning process. Software vendors continue to improve their processes and update their software and their applications, making the systems easier to use and more powerful. This means increased visibility for the clients and increased commissioning management performance for the commissioning authorities. It means improved direction and collaboration for the general contractor and subcontractors. Ultimately, the online Cx tool allows commissioning service providers to deliver their existing processes to the client in a more efficient and technologically savvy way. Learn about BlueRithm commissioning software at BlueRithm.com. This article is based in part on this Consulting-Specifying Engineer article that discusses pros, cons, and challenges of adopting cloud based building commissioning software. BlueRithm – What’s With our Name?